The Starlight Drive-In Theater, in Atlanta, Georgia, has been seeking to maintain the drive-in tradition by modernizing and updating it. Everyone can enjoy a trip to the movies with this fresh but vintage movie experience, meant for the whole family. The Starlight originally opened in 1949, with only one single movie screen. While many original drive-in theaters started closing toward the end of the 1950s, the location and the loyal clientele has kept it going strong since then. The theater added a second movie screen in 1956, followed by 4 additional movie screens in 1983. After the only other local drive-in theater closed in 1998, guests to The Starlight multiplied and secured its place in history. The screens were updated to the newest technology available in 2013. It is often considered a local landmark. 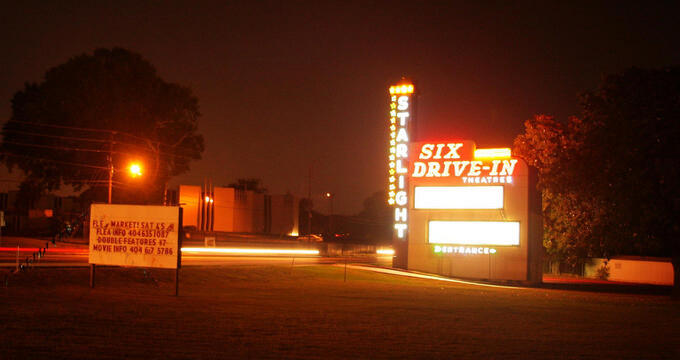 The Starlight Drive-In Theater hosts a double feature movie experience every night of the week. The movies often play second fiddle to the beautiful, vintage, art deco architecture and the lush green landscaping. Parking spots at the Starlight are provided to guests on a first come, first serve basis. It is highly recommended that visitors come around an hour early to make sure that they have an optimal viewing spot of the movie. The closer it gets to show time (which happens at dusk), the longer the line is and the less likely it will be to be able to fully see the screen. Mondays through Thursdays, the box office will open about 45 minutes prior to the first feature. Fridays and Saturdays, that time increases to one and a half hours prior. And, on Sundays, guests can buy their tickets an hour prior. The drive-in’s box office closes right after the second movie begins. Guests must commit to a single screen and are not allowed to switch during intermission. The box office will take cash, Mastercard, and Visa. Audio for the movies featured at the Starlight is broadcast with the use of an FM transmitting radio. Those without FM radios in their cars can choose to bring a battery powered boombox radio with them. Guests who use their own car stereos are strongly encouraged to turn their cars on during the intermission to make sure not to drain their batteries while enjoying the movie. Larger cars, trucks, and SUVs are asked to park near the back of the theater lot to allow everyone the best view of the screen. Guests are allowed to open the hatchbacks of their vehicles provided that they don’t extend higher than the hood of the car. The speed limit on the grounds of the drive-in is 5 MPH. Guests are encouraged to stay in their cars during the movie. If they do choose to sit outside of the car, they should stay in their parking spots with the exception of during intermission. The drive-in features new movies that rotate out on a regular basis. The Starlight’s website maintains an updated list of the movies that are currently playing, as well as a section on those that are “coming soon.” The enormous movie screens have all been updated with the most current technology available, featuring the brightest, sharpest picture available today on a digital projector. The drive-in hosts an annual “Invasion” event, which is a three-day special event that showcases the best Atlanta has to offer in live music, on-site camping, classic cars, and unique classic “B” movies. Over the years, the Drive-In Invasion has become world famous, attracting many famous bands like Man or Astroman?. Guests can stay the whole weekend or just come on a day pass. Around Halloween, the Starlight is home to the Rock & Roll Monster Bash which welcomes local artists, spooky, family friendly movies, and other activities to the grounds. Visitors are welcome to dress up and participate in the fun. Also, on weekends (starting in 1983), the Starlight puts on a flea market with a variety of local vendors. The vendors offer the best of local apparel, crafts, collectables (especially movie memorabilia), and shoes at clearance prices in a great, fun atmosphere. There is a small admission fee to access the grounds, but parking is free. The Starlight offers a fully stocked snack bar with a selection of traditional drive-in movie snacks like popcorn, candy, soft drinks, and other easy to eat snacks. There is also a small selection of Mexican food. Coupons are occasionally available on the Starlight website as well, offering free drinks or popcorn with certain purchases.